12 Wilson had assumed all decision-making powers using bribery, threats, cutting off opponents while they were speaking and adjourning meetings that didn't go his way. When this didn't work he would send his goon squad to deal with those who opposed him Meanwhile, the trial of Means and AIM leader Dennis Banks for their alleged leadership of the Wounded Knee occupation continues in St. Paul, Minn. Jury selection is now in its fourth week and a total of 36 potential jurors are being sought. Only one so far is non-white. Federal Judge Fred Nichol said he will recess the trial until after the run-off elections once the full panel of jurors is selected. (Liberation News Services) PINE RIDGE, OGLALA NATION- ELECTIONS Feb. 8.. Russell Means, a leader of AIM, has declared that he will file for a recount of the votes cast in the election held in the Oglala Nation. He has declared that there were numerous voting irregularities which in the final count gave Richard Wilson a slight edge. It appears that Mr. Wilson used all his influence and otherwise to try to twin the election against Russel Mean. Nevertheless, AIM members feel confident that Russel will win provide that the other side does not cheat. We wait for the recount! WOUNDED KNEE: INDIAN RIGHTS ON TRIAL IOWA CITY Finally, the time has come when the Native Americans of the University of Iowa have an even to prolaim their presence. Native Americans have for years been passive and content to be ignored. 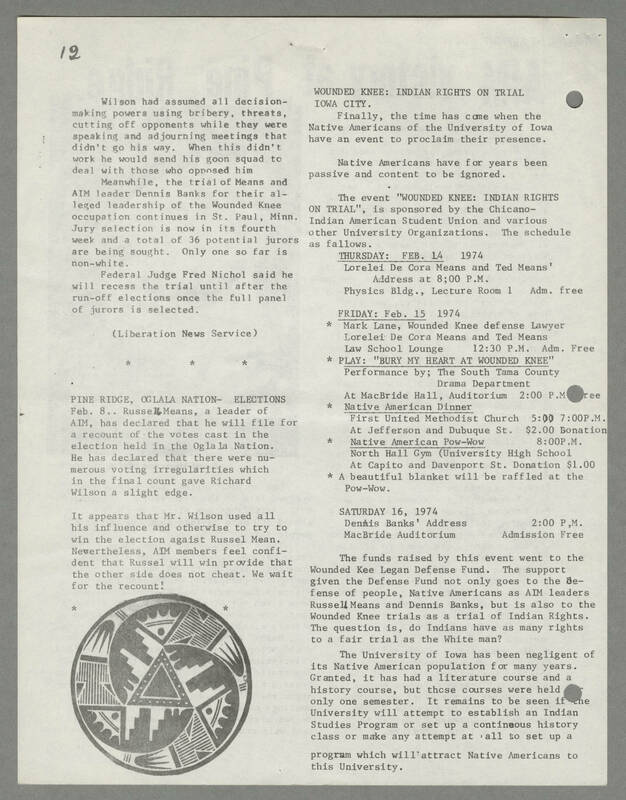 The event "WOUNDED KNEE: INDIAN RIGHTS ON TRIAL", is sponsored by the Chicano-Indian American Student Union and various other University Organizations. The schedule is as fallows. [[underline]]THURSDAY: FEB. 14[[end underline]] 1974 Lorelei De Cora Means and Ted Means' Address at 8;00 P.M. Physics Bldg., Lecture Room 1 Admin. free [[underline]]FRIDAY: FEB.15[[end underline]] 1974 Mark Lane, Wounded Knee defense Lawyer Lorelei De Cora Means and Ted Means Law School Lounge 12:30 P.M. Adm. Free [[underline]]PLAY: "BURY MY HEART AT WOUNDED KNEE"[[end underline]] Performance by; The South Tama County Drama Department At MacBride Hall, Auditorium 2:00 P.M. Adm. Free [[underline]]NATIVE AMERICAN DINNER[[end underline]] First United Methodist Church 5:00 7:00 P.M. AT Jefferson and Dubuque St. $2.00 Donation [[underline]]NATIVE AMERICAN Pow-Wow[[end underline]] 8:00P.M. North Hall Gym (University High School At Capito and Davenport St. Donation $1.00 A beautiful blanket will be raffled at the Pow-Wow. SATURDAY 16, 1974 Dennis Banks' Address 2:00 P,M. MacBride Auditorium Admission Free The funds raised by this event went to the Wounded Kee Legan Defense Fund. The support given to the Defense Fund not only goes to the defense of people, Native Americans as AIM leaders Russell Means and Dennis Banks, but is also to the Wounded Knee trials as a trial of Indian Rights. The question is, do Indians have as many rights to a fair trial as the White man? The University of Iowa has been negligent of its Native American population for many years. Granted, it has a literature course and a history course, but those courses were held (for?) only one semester. It remains to be seen if the University will attempt to establish an Indian Studies Program or set up a contineous history class or make any attempt at all so set up a program which will attract Native Americans to this University.